"Frozen strawberries and watermelon take a spin in the blender with cream, yogurt, and orange juice for a sensational summer smoothie! Serve with a slice of fresh watermelon, or a dollop of whipped cream!" 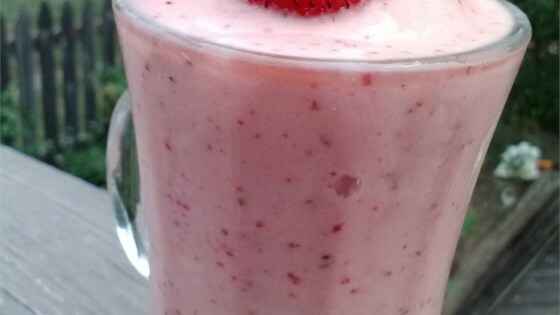 Blend the strawberries, watermelon, cream, yogurt, orange juice, sugar, and vanilla in a blender until smooth. Just ok. Nothing to write home about. Needs more flavor. O well. I had not-very-sweet strawberries and an under-ripe watermelon, but once I put everything together it was GREAT! I will definitely make this again. I used milk instead of cream, and roughed the amounts of that and the yogurt. Great after a walk on a hot day!